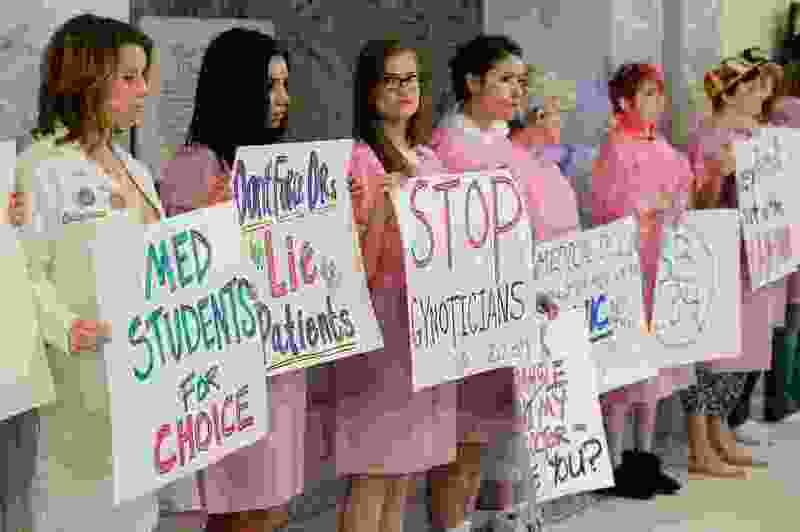 (Francisco Kjolseth | The Salt Lake Tribune) Planned Parenthood advocates hold a silent protest at the Utah Capitol in opposition to SB235 which requires anesthesia for a fetus before an abortion any time after 20 weeks of gestation. Proponents argue that the legislation is not based on science, nor is it in line with standard medical ethics. Citizens understand that legislators must make laws impacting areas in which they lack expertise. That is their job. It is also their responsibility to listen to expert opinion and make laws that result in the greatest benefit and the least harm. Lawmakers failed in their duty to the citizens of Utah when they passed House Bill 136, a law that would ban most abortions after 18 weeks gestation. Real people will be harmed as a result. After extensive counseling, some women choose to end their pregnancies out of compassion to prevent suffering for their unborn child. In some cases, women end pregnancies complicated by a life-limiting fetal abnormality because continuing the pregnancy will lead to the need for a complex cesarean delivery that will increase maternal and neonatal risk in every future pregnancy she carries. Ending a high-risk pregnancy with a grave fetal prognosis can sometimes be important to preserve future childbearing. This is called an abortion, though perhaps not what most people think of when they hear that word. These cases are invariably complex. We testified to the House and Senate before this bill was passed. Thirty-six specialists, from across the political and religious spectrum, with over 300 years of clinical experience, signed a letter sent to every senator detailing our medical concern. We did not come forward to represent either “side” in the national abortion debate, but rather to protect our vulnerable patients who are caught in the crossfire from medical harm. We offered to answer questions and discuss the medical impact of this legislation, giving our personal contact information. How many senators who voted to pass HB136 reached out to understand the medical ramifications of this bill? Zero. This flippant comment trivializes the heart-wrenching situations in which our patients find themselves and it’s incorrect. Many severe fetal anomalies cannot be diagnosed prior to 18 weeks. These families were celebrating their pregnancies until they got devastating news. The representative knew this information because we told him in person right before he made the comment. A Utah senator asked another of our partners during testimony at the public meeting, “Where have you been [if you had concerns about the bill]?” The question left us virtually speechless, as we had exhausted every avenue to alert lawmakers to our concerns. This bill will have a demonstrable negative impact on the health of women in our state. This experience has left us with the impression that Utah legislators wanted to pass an “anti-abortion” bill, no matter the consequences, perhaps with greater interest in making a political statement than in protecting vulnerable women and families. Alexandra G. Eller, M.D., and Cara C. Heuser, M.D., are both maternal fetal medicine specialists with Intermountain Healthcare, affiliated with the American College of Obstetricians and Gynecologists and the Society for Maternal Fetal Medicine. They do not speak on behalf of IHC. Their submission has been co-signed by 29 other maternal fetal specialists: Robert Andres, M.D. ; Ashley Benson, M.D. ; Nathan Blue, M.D. ; D. Ware Branch, M.D. ; Jan Byrne, M.D. ; Heather Campbell, M.D. ; Erin A. Clark, M.D. ; Michelle Debbink, M.D. ; Brett Einerson, M.D. ; M. Sean Esplin, M.D. ; Helen Feltovich, M.D. ; Julie Gainer, M.D. ; Kurt Hales, M.D. ; Ibrahim Hammad, M.D. ; Calla Holmgren, M.D. ; G. Marc Jackson, M.D. ; Torri Metz, M.D. ; Martha Monson, M.D. ; Jessica Page, M.D. ; T. Flint Porter, M.D. ; Douglas Richards, M.D. ; Nancy C. Rose, M.D. ; Glenn Schemmer, M.D. ; Rita Sharshiner, M.D. ; Marcela Smid, M.D. ; Shannon Son, M.D. ; Amy Sullivan, M.D. ; Lauren Theilen, M.D. ; Paul Whitecar, M.D.